Chittenden County State's Attorney Sarah George wants Vermont to establish supervised heroin-injection sites. She has signed off on expunging more than 100 criminal records, many of which were marijuana-related. 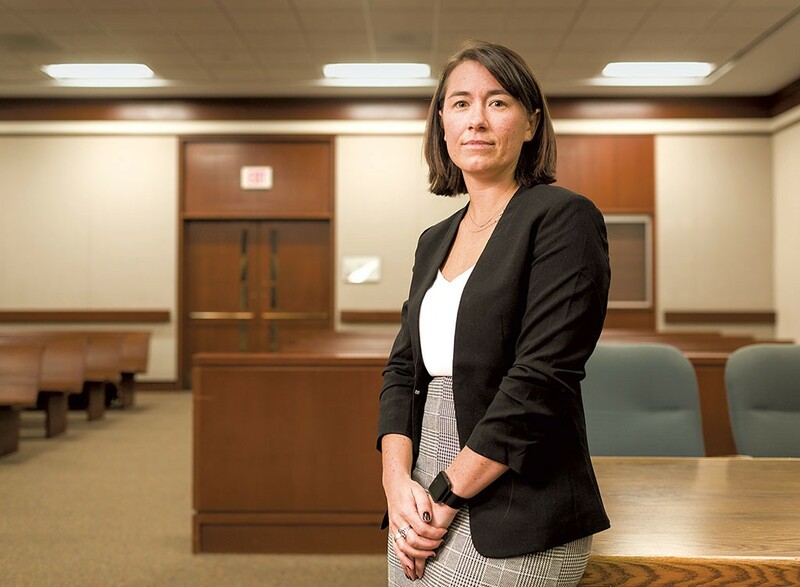 To help combat the opiates scourge, she no longer prosecutes people facing misdemeanors for possessing addiction-treatment drugs without a prescription. Although she has no opponent in the November 6 election, the incumbent Democrat is campaigning anyway. She's stumping for a more humane approach to criminal justice. Over the past year, George has traveled to four conferences sponsored by left-leaning Fair and Just Prosecution. The national criminal justice reform organization strives to reduce incarceration and to promote rehabilitation, court diversion and bail reform. Its website asks: "Can prosecutors be vehicles for social change?" "It's always been clear to me that our system is not as fair and impartial as we want it to be," said George, who was appointed to her job in January 2017. Prosecutors have "enormous power," she continued, and "you can wield that power for incredible good or for incredible damage." In one of her frequent tweets, George linked to a New Yorker profile of one of her heroes, Philadelphia district attorney Larry Krasner, who has called for an end to mass incarceration. George recently traveled with Krasner to visit a safe-injection clinic in Vancouver. At times the 35-year-old Vermont native sounds more like a public defender than the county's chief prosecutor. "She's really smart. She's a great communicator," said Ruth Hardy, executive director of Emerge Vermont, which trains Democratic women to run for office. Earlier this year, George completed an Emerge course with top marks, according to Hardy. "She's very focused on making sure she is doing her job well and being a leader on issues that she has expertise in," Hardy said. Right now George has no ambition beyond her current job, she said during an interview in her neat, organized office at Burlington's Costello Courthouse. A set of hand weights rested on the floor in a corner. George is a former varsity high school soccer, tennis and basketball player who likes to squeeze in a few reps whenever she can. Historically, though, her position has been a springboard to higher office. U.S. Sen. Patrick Leahy (D-Vt.) held the job when he ran for Congress and went directly to Washington, D.C., without stopping in Montpelier. George's former boss, T.J. Donovan, worked as state's attorney for 10 years before being elected Vermont attorney general in 2016. Donovan took over for retiring AG Bill Sorrell, who also worked as Chittenden County's top prosecutor. Given three Democrats to choose from, Gov. Phil Scott appointed George to finish out Donovan's term in January 2017. She had worked six years for Donovan as an assistant state's attorney, focused mostly on domestic violence cases, when she got the call. "I think she's got a political future if she wants one," said Donovan, a fellow Democrat who also favors criminal justice reform. Others see it somewhat differently: "She's certainly not afraid to advocate for the position she believes in, regardless of the politics," Burlington defense attorney Brooks McArthur said of George. In September, Burlington's police chief and mayor criticized George for being too soft on crime — on one alleged crime, anyway. The drubbing came after George declined to prosecute a man who brandished a gun in a heated argument outside downtown Burlington nightclub Nectar's. Another man involved in the dispute fired his gun, critically injuring an innocent bystander. The first man behaved recklessly but likely would not have been convicted because self-defense was a factor, George contended. Police Chief Brandon del Pozo, who also paints himself as a reformer, said it should have been up to a jury to decide. Mayor Miro Weinberger, a Democrat, tweeted that "a free pass sends the wrong message." Republicans piled on. City Council President Kurt Wright (R-Ward 4) called George's decision a "disgrace" on Facebook and added that he has "zero confidence" in her leadership. Paco DeFrancis, chair of the Burlington Republican Party, told Seven Days via email that assailants "feel emboldened to become violent" in downtown Burlington when they realize the consequences "will be negligible." When asked about the brouhaha, George paused to collect her thoughts, then appeared to choose her words carefully. "I absolutely stand by my approach. I was basing that decision on the law and the evidence that we have," George said. She pointed out that Rashad Nashid, the man who allegedly shot the bystander, is facing charges in both state and federal courts. Del Pozo won't back down, either, noting that his criticism of George marks the first time he's publicly challenged a charging decision since he became chief in 2015. He qualified his critique by saying: "It does nothing to diminish my faith in Sarah's ability to protect the people of Chittenden County through prosecution." While neither he nor Donovan is in favor of supervised injection sites, both law enforcement leaders do agree with George's decision to stop prosecuting misdemeanor possession of buprenorphine without a prescription. The goal is to reduce barriers to treatment. "I think that it has the real potential to save people's lives," George said. But not all Vermont cops are on board. State Police Director Col. Matthew Birmingham, for example, issued a memo telling his troopers to continue to make arrests for possession of buprenorphine without a prescription, including in Chittenden County. That kind of opposition doesn't seem to faze George, who often uses social media to express herself, sometimes without a filter. Her Twitter profile ranks her No. 1 and No. 2 priorities as public safety and criminal justice reform, followed by "changing old white dudes [sic] opinions on 1 & 2." After the Burlington City Council voted 9-3 in July to support a resolution to consider safe injection sites, George tweeted her praise for those who voted yes and her frustration with those "who think a discussion on the topic isn't worth their time." The tweet and George's remarks at the meeting irked Wright and City Councilor Jane Knodell (P-Central District), both of whom voted no. Knodell posted on Facebook: "Instead of presenting argument and evidence, she criticizes and demeans those who disagree with her. I expect much better from a Chittenden County State's Attorney." To her credit, George engages her critics. She recently reached out to three of her regular sparring partners on Twitter, including DeFrancis, to meet up for coffee. They agreed, she said, though the confab hasn't happened yet. As for being soft on crime, George said she is not hesitant to aggressively prosecute offenders and has put many domestic abusers behind bars for long periods of time. 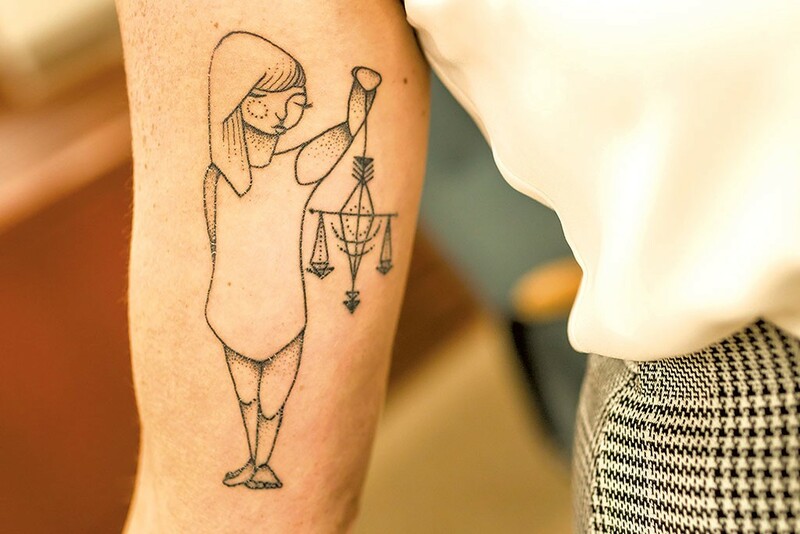 She loses no sleep over those sentences, said the woman who recently used Instagram to show off a new tattoo of the scales of justice on her right bicep — her eighth piece of body art. How did a Quechee girl end up in charge of the busiest prosecutor's office in Vermont, where she manages 24 people, including 14 attorneys, working on about 5,500 cases a year? The daughter of a nurse and a contractor, the Hartford High School grad earned a degree in criminal justice and psychology at the University of Connecticut, followed by a master's in forensic psychology from what is now known as Castleton University. She graduated from Vermont Law School in 2010 and passed the bar exam on her first try. Friends remember her as disciplined and engaged — but not the type who raised her hand often during classes at VLS. "She was that person who always had the assignment done days before it was due," recalls friend and classmate Cara Cookson, public policy director at the Vermont Center for Crime Victim Services. "She was always so focused, and she was extremely hardworking." Another photograph shows professional snowboarder Nicolas Müller soaring above a snowy peak. George enjoys the sport with her partner of 16 years, Zeb White, a product manager at Burton. They live in South Burlington. While in law school, George held down a waitress job at her hometown's tony Mill at Simon Pearce. George still serves diners there two weekends a month. Although she earns $116,334 at her day job, she moonlights to pay off her student loans, which she describes as "financially ... crippling." She's enrolled in a federal loan forgiveness program for public employees but is on the hook until 2022 for more than $1,000 per month. Serving Chardonnay and cheddar soup to busloads of leaf peepers gives George a welcome break from her full-time job menu of homicide, DUI and burglary. "It allows me to kind of shut off from this work in a way that I would not be able to do otherwise," George said. The Chittenden County state's attorney is an excellent waitress, said Wendy Jackson, the dining room manager. "It's all about people and having empathy, and I think that that's her strong suit — being able to read people and get where they are coming from," Jackson said. That trait was evident when George talked about cases. She still handles a small number herself. That includes prosecuting Steven Bourgoin on five counts of murder for driving the wrong way on Interstate 89 in 2016, causing a crash that killed five Mad River Valley teenagers. Bourgoin's insanity claim has prolonged the case, said George, and the prosecution has hired its own expert to evaluate him. She hopes the case will go to trial by March and regrets that victims' families are still waiting for their day in court. "It's extremely heartbreaking," she said. "They are anxious for this to be over." Does she have the street smarts necessary to succeed in court? "She's got it," said Cookson, George's law school colleague. In a highly unusual move, Burlington police on Friday publicly criticized prosecutors for not pursuing criminal charges against a Colchester man who claimed self-defense for his role in a downtown shooting that injured an innocent bystander.